Nobel Laureate Art McDonald dared to dream big when it came to testing the hypothesis behind what was to become his biggest discovery. The world-renowned physicist and Dal alumus built a team of 274 scientists, secured 1,000 tonnes of heavy water and oversaw the construction of a giant lab the size of a 10-storey building in an underground mine. But Dr. McDonald’s experiment wasn’t just physically and operationally massive — it was also scientifically bold and adventurous. The aim of his high-stakes, years-in-the-making experiment was to answer the long-held question in physics of whether neutrinos (one of the tiny building blocks of the universe) have mass. Luckily, he found an answer: they do. While their specific motivations may vary, most great researchers embody at least some of the same visionary qualities that have defined Dr. McDonald’s work: curiosity, ingenuity and drive. That’s certainly the case with Dal researchers Randall Martin and Jean Marshall, named Thursday as the first holders of a prestigious new research chair award set up at Dal this year in Dr. McDonald's honour. 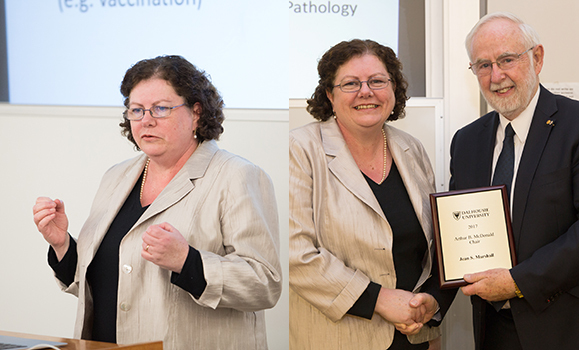 As awardees of the Arthur B. McDonald Chair, Drs. Martin and Marshall will receive $50,000 a year for up to seven years to build upon their already substantial bodies of research. Dr. Martin, a professor in the Department of Physics and Atmospheric Science, has dedicated his career to understanding atmospheric composition and its implications for human health and climate. His lab is best known for its pioneering use of global modelling in producing satellite-based estimates of fine particulate matter, now recognized as the leading environmental risk factor for premature mortality worldwide with 4 million attributable deaths a year. The World Health Organization, the World Bank and UNICEF are a few of the organizations using data produced in Dr. Martin’s lab to drive their advocacy and policy work. The Organization for Economic Cooperation and Development has even estimated that the welfare costs of the deaths related to these tiny atmospheric particles to be in the range of 3-4 per cent of global gross-domestic product. “I continue to be amazed by the impact that these data are having,” says Dr. Martin, whose previous awards and honours include the E.W.R. Steacie Memorial Fellowship and induction into the Royal Society of Canada. Dr. Martin says the McDonald Chair will provide him with the flexibility he needs to expand his research in this area. Similarly, Dr. Marshall says the fresh support from Dal will enable her lab to attract more promising trainees in areas that can drive her research program forward. Rather than waiting until funding becomes available to bring in new talent, she says she’ll have the ability to act more quickly to build her team’s strength in priority areas. Dr. Marshall joined Dal’s Department of Microbiology and Immunology in the Faculty of Medicine nearly 20 years ago and her lab has been internationally recognized for its studies on the role of mast cells in defence against infection and cancer and in chronic inflammatory diseases. Mast cells had for a long time been seen as useless in a therapeutic sense, but her research helped show that they could be used strategically to manipulate immunity to fight cancer or prevent allergic diseases. Some of Canada’s largest health-related research investment agencies have funded Dr. Marshall’s research, much of which is done in close collaboration with clinicians. She says that direct impact is something that drew her to the field of immunology in the first place. Drs. 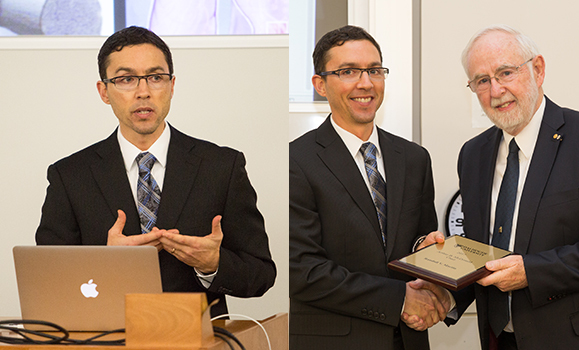 Marshall and Martin were invited to a ceremony Thursday afternoon in Dal’s Collaborative Health Education Building to receive plaques from Dr. McDonald, who was in town to mark the launch of the new research initiative. Chair holders are also expected to be successful in attracting top-quality students to their labs and training them to become future research leaders, something both of the Chair’s first occupants cite as a key priority. For Dr. Martin, that means fostering his trainees’ “rigorous independence.” For Dr. Marshall, it’s seeing them take ownership of their projects and getting creative in their approach to them. It’s that same spirit of ingenuity and determination that inspired Dr. McDonald to undertake his ground-breaking experiment more than 15 years ago and that will no doubt continue to inspire generations of scientists at Dal and beyond in the years to come.